MISSION, KS--(Marketwired - Jul 18, 2016) - (Family Features) Whether you're prepping for an extravagant party or an impromptu get-together, being prepared with cupboard staples and entertaining tricks can help you take your gathering to the next level. When it comes to bite-size snacks, crackers are one pantry basic you can dress up or down for a wide range of party-worthy treats in minutes. For example, garden-fresh fixings atop crisp crackers make for light canapes that celebrate the best of summer flavors. Just start with one of Dare's mouthwatering crackers, loaded with crunch and packed with flavor, and pile on the goodness. 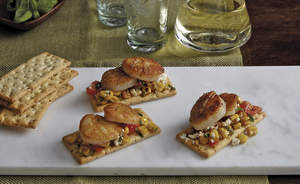 If you're looking for an elegant appetizer to wow dinner guests, a robust, crisp cracker makes the perfect base for a sweet corn salad and luxurious scallops. Or, for a delicious sweet treat, use Dare's sweet potato cracker to lend a unique twist to a classic s'mores recipe.